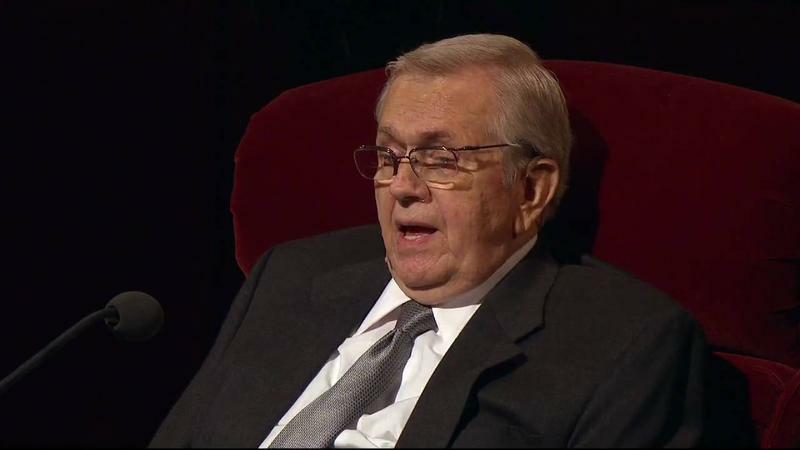 Doug Fabrizio interviewed Greg Prince on KUER this past week on the passing of Boyd K. Packer. (You can listen to it here.) Prince is a businessman, a historian of LDS church history, and a board member of Dialogue: A Journal of Mormon Thought and The Journal of Mormon History. He’s author of the books Power from on High: The Development of Mormon Priesthood and David O. McKay and the Rise of Modern Mormonism. Prince noted the stark contrast between the comments made regarding Elder L. Tom Perry’s death, who passed away just a few weeks ago, to Elder Packer’s death. While Perry was nearly universally praised, some revered and venerated Packer as “the glue that was keeping the church together” for decades. Others called him a “bully” and lauded his death as it would prevent him from being the church president and furthering his influence. It got me thinking about how polarizing Elder Packer was. I think he was the most polarizing apostle since Bruce R. McConkie. Here’s some of the polarizing things, both good and bad about Elder Packer that I took from the interview. He was born in Brigham City and had polio at age 5. In his later years, he suffered from post-polio syndrome which was very debilitating and confined him to a wheelchair. Surprisingly (at least to me) he ran for city council in Brigham City as a democrat. He has always been very conservative. I suspect today he probably aligns more with conservative republicans than democrats. Perhaps this is a sign of how the parties have changed over the years. Packer led by edict, not consensus, and was very top down in his approach. He is quoted several times as saying, “I am here to teach, not be taught.” Prince noted the contrast with “trickle up revelation” that was prevalent in the church in the 1950s and 60s. Several grass roots initiatives were later embraced by the entire church. This mostly stopped since Packer was ordained an apostle in 1970. In his defining polarizing talk, he was outspoken in his criticism of feminists, intellectuals and gay people. Prince gives a bit more back story of this talk. The talk was given in May 1993, shortly after a legal case in Hawaii in which gays were suing for the right to marry. The Hawaiian Supreme sent the case back to lower courts, and emphasized that the legal concept that “strict scrutiny” should apply to the decision making regarding gay marriage. Many conservatives were concerned because they felt if strict scrutiny were applied, gay marriage would eventually become legal, as it did 2 decades later. His comments claiming that sexual orientation was a choice and “why would a loving God do that?” are directly linked to suicides among the LGBT population. It was noted that the church changed rhetoric to distance itself from his stance, and even went so far as to edit out of audio, video, and written transcript his talk in which he tried to canonize the Proclamation on the Family. A few months after this [in]famous talk, six intellectuals were disciplined (known now as the September Six–five were excommunicated and one disfellowshipped.) The church initially claimed that these were “local matters”, but when Steve Benson, grandson of President Ezra Taft Benson, published claims that Elder Packer made calls to stake presidents about disciplinary councils, the church had to retract the statement that these were simply local matters. Prince said that Packer was threatened by feminism and told an anecdote where a woman had been invited to attend a meeting. Packer told the woman she couldn’t attend the meeting, because “you’re a woman.” Prince said this was pretty typical that Packer was threatened by feminism. Prince noted that the Feminine Mystique was founded in 1963, National Organization for Women was founded in 1965, Packer was ordained an apostle in 1970, and in 1972 the Equal Rights Amendment was passed by congress. These were all very important events that influenced Packer, causing him to influence the Church to mobilize in having the ERA defeated, especially in Utah. Idaho had already been approved the ERA amendment, then rescinded the approval after influence from LDS Church leaders. Packer’s wife didn’t work outside the home and they had 10 children. This likely influenced what he considered to be a normal, successful family approach and why he was such a hardliner against feminism. Packer didn’t want female voices in church leadership. Despite this controversial talk, Packer was more concerned with behavior than doctrine. Salt Lake Tribune reporter Peggy Fletcher Stack said baptism, forgiveness were major themes of his sermons, which were usually pastoral in nature, and typically didn’t involve doctrine or hard issues, his two infamous talks notwithstanding. One caller to the program said correlation has destroyed our hymns. Packer felt that musical numbers in the church should only involve hymns, and was the driving force to eliminate road shows. Road Shows were usually put on by each stake where wards created plays or skits. One caller said that Packer has sucked the life out of the church, and Prince agreed. Packer also intervened in BYU’s theater department despite it not being in his purview and having no expertise or background in music. He didn’t hesitate to pick up the phone and prohibit them from doing things he didn’t like. He was originally on the board of trustees for BYU, and even after his time on the board, he maintained close ties with influential people there and maintained tight control on what happened at BYU. In the early 1970s, he went down to the music department and gave a very critical speech on what the faculty and students in the music department were doing despite having no expertise in music. Elder Packer served as a bomber pilot in World War 2, but rarely discussed this in any of his sermons. On the other hand, Elder Paul Dunn discussed his military service frequently. When it was discovered Dunn had embellished his tales, Packer was extremely critical of Dunn. Prince surmises that Packer did not see combat duty in WW2. As a side note, I watched a very interesting documentary on baseball player Ted Williams. Williams baseball career was interrupted by his service in WW2, but Williams did not see combat either. Williams instead served as a pilot instructor, and returned to baseball. However, when the Korean War broke out, Williams saw intense combat. What are your thoughts on Elder Packer? Why do you think he was so polarizing?